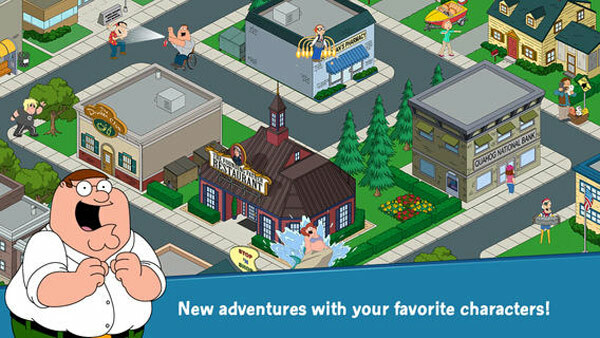 When the Giant Chicken picks a fight with Peter Griffin, Quahog is left in ruins. It’s up to Peter to rebuild it, but he needs your help! 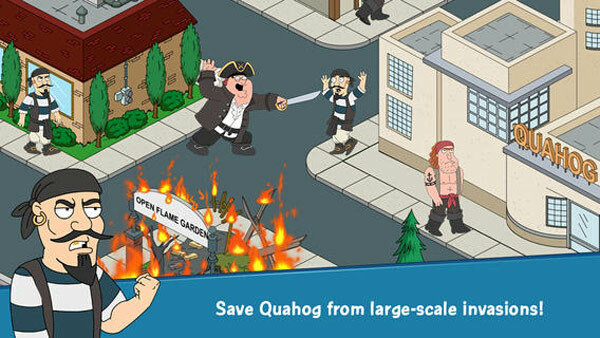 Rally your favorite Family Guy characters (even Meg) and save Quahog. Lacking any sense of strategy or challenge, Family Guy: The Quest for Stuff is time consuming busywork. It's going to take a heck of a long time to get anywhere playing it, and that destination isn't even particularly fun. 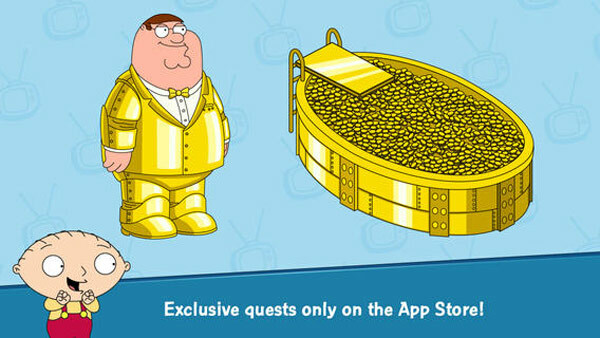 Family Guy: The Quest for Stuff is off to a great start and as a free to play title it has tons of game play to offer without even spending a nickel. I was hooked on The Simpsons: Tapped Out for over a year, and since questionable humor is my cup of tea, my Quahog days are far from over. Family Guy: The Quest for Stuffapes The Simpsons: Tapped Out without quite understanding why the latter has remained a hit. Some Family Guy fans may consider a temporary move to Quahog, but chances are good they’ll go back home to Springfield before long. As you can tell from these examples, the actions in The Quest for Stuff range from being funny, to absurd, to very “mature rated”. 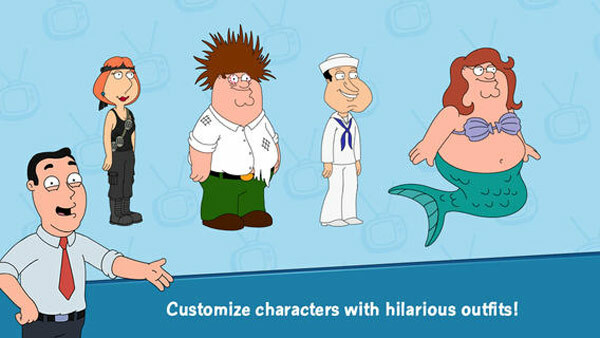 Not that you should expect anything else from a Family Guy game. It’s these actions that give this game much of its life. 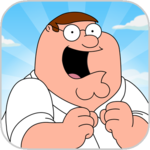 How much life that is for you depends on how much of a fan of Family Guy you are, and whether the freemium model and wait times turn you off from unlocking all of the game’s content. If you’re familiar with this style of F2P gaming, you may want to pass or wait a bit to see if the developer decides to add some balancing adjustments to the time investment and real currency expense. 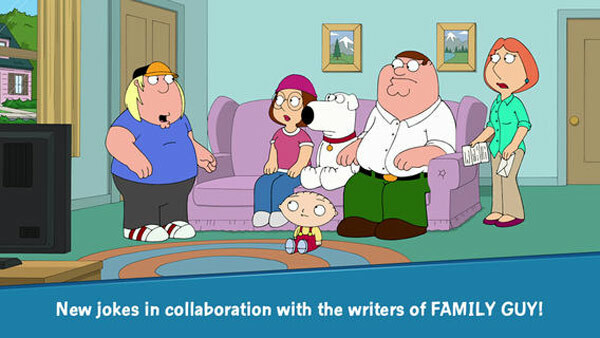 Family Guy: The Quest for Stuff may appeal to fans of the show; it’s hard to say with certainty that if you like the show, you’ll like the game. The humor and styling of the show is here, and there is a ridiculous amount of fan service to be had, but it’s ultimately a very slow paced game, with aggressive and constant prompts to buy clams, and more waiting around than actually playing. And for those reasons, I simply can't recommend it. While there's precious little actual game here, there's plenty of amusing content. Whether you think the time and effort investment is worth the humour reward is largely dependent on how much you enjoy the Family Guy TV show. Fans will probably get a lot of enjoyment from this game, whether they spend real money or not. 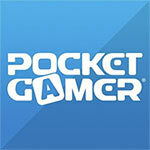 Everyone else is probably better looking elsewhere for their free-to-play fix. A cynical imitation of an already dull game, we would rather download Windows updates than play Family Guy: The Quest for Stuff.